Ruled daily blocks for more legible entries. 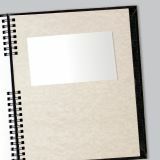 Textured hard cover with twin wire binding lies completely flat or folds back. 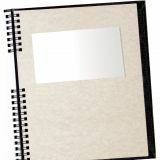 Double-sided pocket for keeping loose papers. Sturdy hard cover makes book archivable. Note: A minimum quantity of 39 must be ordered, and in units of 1 thereafter. Rediform Hard Cover Monthly Planner - Monthly planner offers a hard cover and CoilPro twin-wire binding for durability and easy access. Dated planning pages range 14 months from December to January for more complete scheduling. 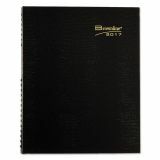 Each two-page-per-month spread offers ruled daily blocks, Sunday-through-Saturday scheduling, a designated space for notes, count of days/days remaining, holidays, tear-off corners and past, current and four future months reference. 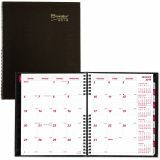 Nonrefillable planner also includes a telephone/address section and is printed in English.